How to Heal a Broken Heart On a crisp fall morning in November, Mary Yoder awakens in the valley at the foothills of the Adirondacks on her wedding day. The only problem? Joshua Beiler broke their relationship off six months prior. And now he plans to wed his new sweetheart on the exact same day Mary was to be his bride. Heartbroken, Mary forces herself to walk to work alongside her sister, Becky, for moral support. When the sisters arrive at the food co-op, it seems that everyone in the Amish community knows of Mary's misfortune. That includes Stephen Overholt, a longtime bachelor who Becky suspects has plans to take advantage of her sister's vulnerable state. And he's not the only one. Mary's neighbor, Mrs. Gabert, launches her own matchmaking effort when her grandson, Willard, visits for the week. Willard invites Mary and Becky to a talk he's giving on his upcoming mission to Kenya. As Mary struggles to accept the Lord's will and find healing, she must determine whether or not one of her potential suitors can give her the future Joshua denied her. 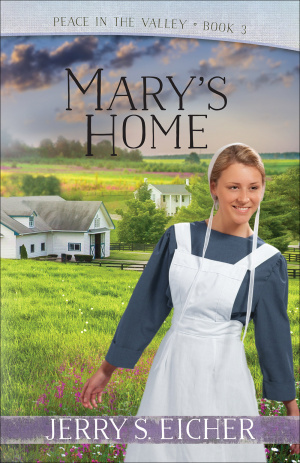 Mary's Home by Eicher, Jerry S. was published by Harvest House Publishers in August 2017. The ISBN for Mary's Home is 9780736969345. Be the first to review Mary's Home! Got a question? No problem! Just click here to ask us about Mary's Home. Author / Artist Eicher, Jerry S.